With all the cafes, bars, restaurants, and lounges in Georgetown, what does another eating establishment bring to the table? Why, well prepared seafood at reasonable prices in a no frills maybe-I’m-in-New-England setting – that’s what. 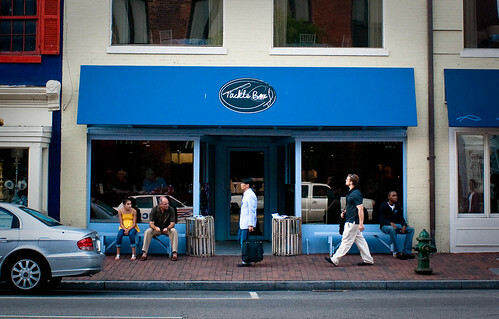 Located in the hustle and bustle of M Street in Georgetown, Tackle Box is a great place to grab a good meal in under an hour. 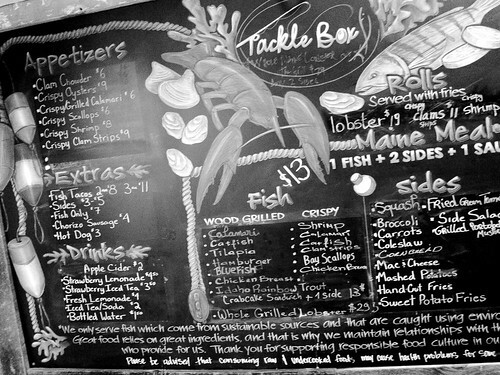 Former Hook chef Barton Seaver opened Tackle Box in the space next door to his formal restaurant in 2008. 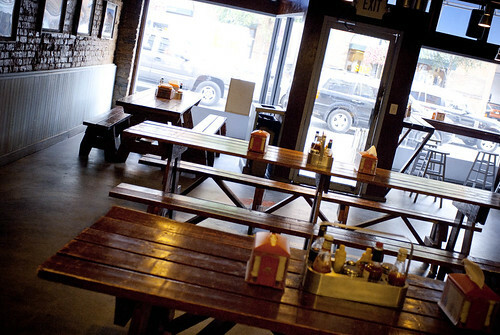 Like Hook, this small, casual, counter service establishment focuses on fresh, sustainable ingredients. While there isn’t sand or the sound of water lapping at the docks, Tackle Box tries its best to place you in New England. Go in the summer, and the buoys hanging from the ceiling, the picnic tables, and the smell of grilled seafood may have you forget about the traffic jam outside. 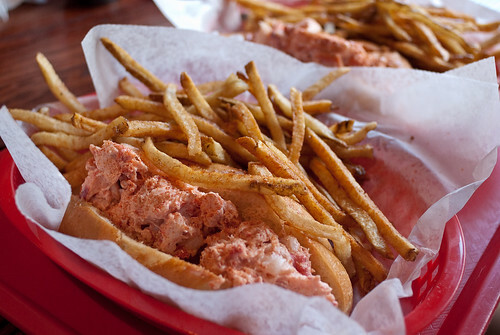 A favorite dish of ours is the Lobster Roll. 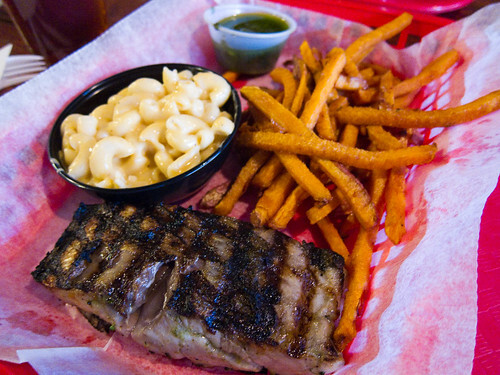 The meat is sweet, and is complimented nicely by the well seasoned dressing. Although, if they just handed out the rolls, buttered and grilled to a crispy finish, I’d imagine diners would be just as happy. 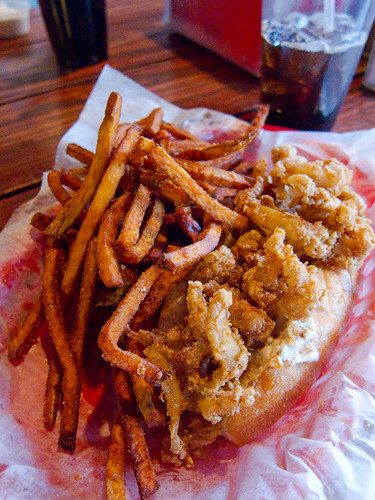 All the rolls (lobster, fried clams, shrimp and often oysters) come with a side of fries. 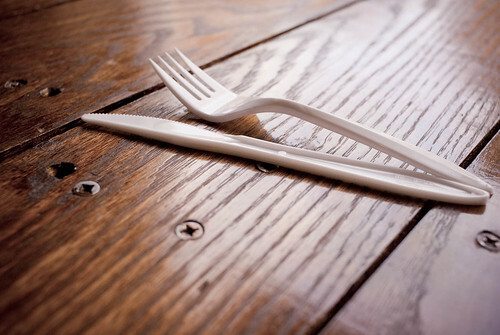 While there is seasoned salt and ketchup on the tables, I would like to see a little more seasoning while there is still some oil on the fries, and maybe a dipping sauce added? We’ve tried the sweet potato fries with the lemon aioli from the grilled fish dinner, and it was delightful. While it’s hard to outshine lobster, a hardwood grilled piece of fresh fish with 2 sides for $13 does the trick. You can choose from around 4 different fillets that each pairs nicely with a wide range of sauces. While the sides may seem more at home at a BBQ joint than seafood shack, they’re well prepared and when you’re eating, taste is all that matters. Sweet tea and fountain drinks round out the meal, and while some diners may want a beer or glass of wine, I’ve found the free refills of Stewart’s root beer to be enough. YUM… this I will have to try.